Really "Outside of the Box!" Roch's thinking is really "Outside of the Box" when it comes to something so innocent as a little origami box built in front of you in a matter of seconds out of just six playing cards. Ray teaches how to quickly build, and gives away his in depth secrets, which turns his Impossible Box into a diabolical magical device for producing, vanishing and switching. The moves which Ray showed us could have only be honed through years of performance, but Ray is able to teach us the artifice which makes the Impossible possible to master, and completely adaptable to one's own routine and patter. Not only does Roch give you a very magical and entertaining routine which even fools magicians, but he also gives you the ability to easily create an instant cost-nothing working prop anytime for yourself or a unique souvenir for your volunteer which that person will value and keep forever. Long time Magician, Ray Roch is the originator of a DVD called "The Impossible Box", a chronicle showing how to build and load an origami card box utilizing 6 playing cards. There are multiple methods of loading items shown during its construction, including a bonus effect where the completed box mysteriously moves and levitates. These effects, along with a routine where a chosen card is found folded in a box are all included in "The Impossible Box". 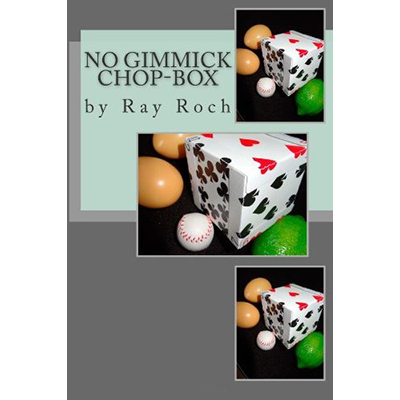 However since the DVD was made, Ray made significant improvements to his original concept and reveals them in his "No Gimmick" Chop-Box book.